As to remodelling, people often have neither the financial resources, nor enough free time to do a thorough reconstruction. However, it does not mean that you cannot rearrange your home noticeably. You can start with your bathroom. Although your bathroom may not need a major facelift, a little embellishment would certainly be beneficial. Here are a few tips that will help you. Replacing the tiles, a new bath, a completely new lighting or new water taps, all these things cost quite a lot of money. You can put a new face to your bathroom even without similar big investments. Repainting is a quick way to change virtually any room. If you do not want to start a larger project, you can choose just one wall and make it a so-called accent wall; the other ones should obviously remain in a neutral tone. Even a little easier solution is to add a colour pattern to one of the walls. You can buy painter´s and decorator´s supplies (templates, large stamps) in a hobby shop, just do not forget to measure the size of the decor and plan it correctly the advance. A nice pattern can be created by a small motif with a proper spacing. In other words – try out some pictures. 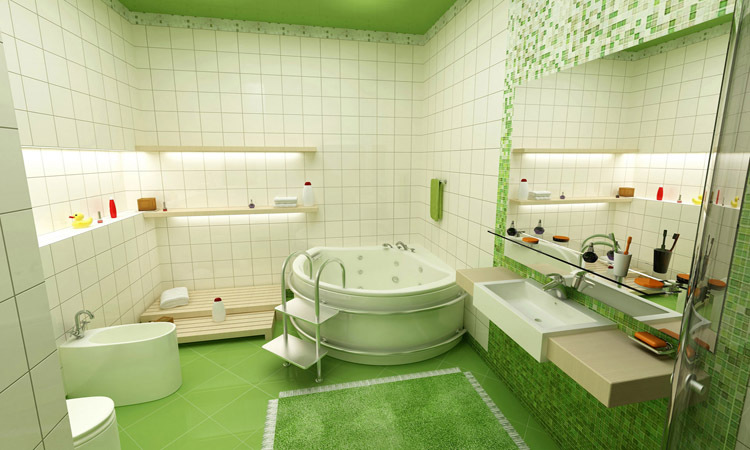 They are not only suitable for a living room or a bedroom, they will have a nice effect in a bathroom, too. You can watch them while relaxing in the tub, they will cheer you up in the mornings when you brush your teeth or they can soothe you before you go to bed. Of course, do not place valuable works of art in a bathroom. Use reproductions or just photographs and put them in colour plastic frames. Do you have a large mirror in your bathroom? You can take some family photos and stick them on along the edges. Have you ever noticed what a big change can be made by an ordinary shower curtain? It is perfectly suitable for this, as it forms a large area which is very visible, but not pricey and easily replaceable; you can change the look of the bathroom by simply pushing it. You do not need to buy the cheapest plastic curtain, as the fabric ones with a waterproof layer are also available. Alternatively, you can buy a few curtains and change them according to your mood every few weeks. How about buying e.g. a curtain in bright colours for the spring and summer time and a warmer fabric one for the autumn and winter time? Strictly throw all the ugly plastic or cardboard boxes in which you have stored your cosmetics and other needs until now. Your bathroom needs supplements that upgrade it and make it a luxury spa delightful to look at. Purchase wicker baskets, a porcelain soap dispenser and a toothbrush cup. Turn the old towels with faded colours to cleaning rags and purchase a set of towels and bath towels in a single colour that suits to the bathroom. You will see that the room is more attractive, at once. And finally, we have a tip for those who really love art. If you have the white tiles (either wall or floor ones) in your bathroom, you can decorate them with a pattern similar to what we said above. Again, it can be a printed decor, a painting with a template or a completely free style painting. Of course, not everyone is confident enough to take a brush straight on the tiles, but you need not despair, there is another option: the stickers. We talk about the residential stickers, which have been a big hit quite recently, and still can normally bought. Purchase a set of small motifs and stick them on the tiles in your bathroom in a way to form a decorative pattern.